We offer three Training Access Levels: I, II, and III, giving you access to our content library of 850+ items based on your subscription level. Unlimited access to all phishing features. No artificial license ceilings and 10% overage allowance. 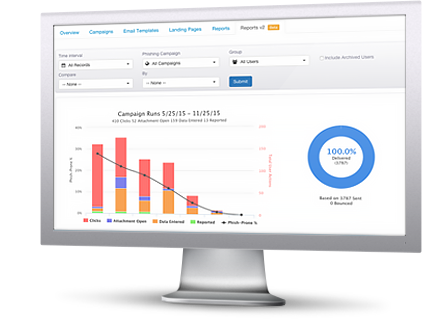 You'll see reporting for training and phishing campaigns as well as a general overview of your last 5 campaigns. With 60+ built-in reports, you get insights that provide a holistic view of your entire organization with instant detailed reporting on key awareness training indicators. The new innovative Virtual Risk Officer functionality helps you monitor where you stand over time showing you the Risk Score by employee, group, and your whole organization. With the revamped end-user training interface, your users get a fresh new learner experience that makes learning fun and engaging. With the optional customization features to enable gamification, your users can compete against their peers on leaderboards and earn badges while learning how to keep your organization safe from cyber attacks. Want to supplement your KnowBe4 security awareness training content with your organization’s custom training or other corporate training content? Now you can! 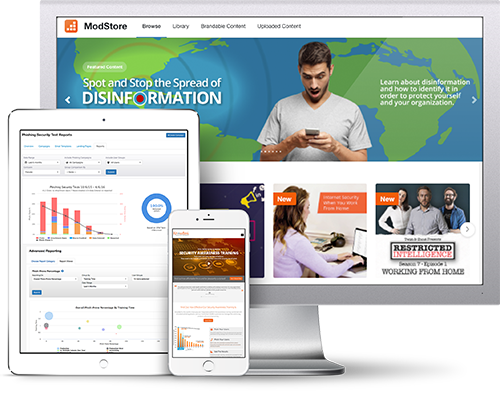 Upload your own SCORM-compliant training and video content and manage it alongside your KnowBe4 ModStore training content all in one place. You just got your very own mini-Learning Management System! With the new Virtual Risk Officer and Advanced Reporting features, you can start to identify risk at the user, group, and organizational level that helps you make data-driven decisions when it comes to your security awareness plan. You see next-level-reporting for phishing and training campaigns that help you measure the effectiveness of your security awareness training program. Many IT pros don’t exactly know where to start when it comes to creating a security awareness program that will work for their organization. We’ve taken away all the guesswork with our Automated Security Awareness Program (ASAP). ASAP allows you to create a customized program for your organization that helps you implement all the steps to create a complete security awareness training program in just a few minutes! Find out how tens of thousands of organizations have mobilized their end-users as their last line of defense. We offer three Training Access Levels: I, II, and III, giving you access to our "always-fresh" content library based on your subscription level. You will get web-based, on-demand, engaging training that addresses the needs of any organization whether you have 50, 500 or 5,000 users. Kevin Mitnick Security Awareness Training specializes in making sure employees understand the mechanisms of spam, phishing, spear phishing, malware and social engineering; and are able to apply this knowledge in their day-to-day job. Trainees get unique job-aids: Social Engineering Red Flags™ with 22 things to watch out for in email, and 20 ways to block Mobile Attacks (PDF). The Training Campaigns do the heavy lifting of getting your users through their training. Our 5,- 15-, 25- and 45-minute basic training modules specialize in making sure employees understand the mechanisms of spam, phishing, spear phishing, malware, ransomware and social engineering, and are able to apply this knowledge in their day-to-day job. You get high quality web-based interactive training combined with common traps, live demonstration videos, short comprehension tests and scenario-based Danger Zone exercises. An advanced, condensed 15-minute version which specifically focuses on APT and phishing and is now available in 26 languages. You can schedule regular Phishing Security Tests (PST for short) from our large library of more than 2,500 "known-to-work" templates, choose from the community templates section, which were created by admins for admins to share with their peers. You can also create your own custom phishing templates. There are many more features! In addition, KnowBe4’s no-charge Phish Alert Button reinforces your organization’s security culture, users can report suspicious emails with one click. Now also supports Outlook Mobile! 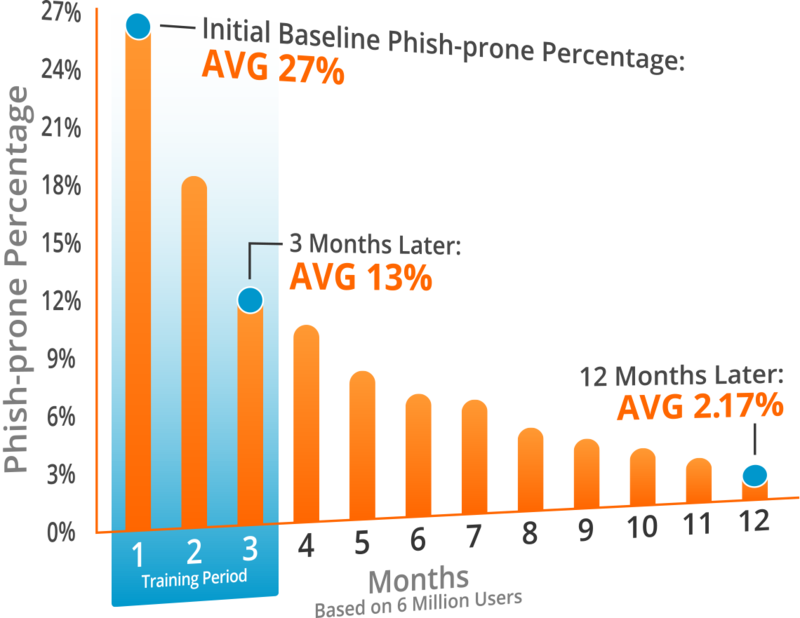 PhishER™ is your lightweight Security Orchestration, Automation and Response (SOAR) platform to orchestrate your threat response and manage the high volume of potentially malicious messages reported by your users. 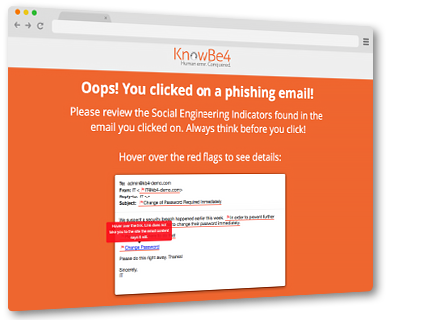 Emails can be reported through the KnowBe4 Phish Alert Button or simply by forwarding to a mailbox. With automatic prioritization for emails, PhishER helps your InfoSec and Security Operations team cut through the inbox noise and respond to the most dangerous threats more quickly. Available as an optional add-on across all subscription levels. Social Engineering Indicators™ (SEI) patented technology, turns every simulated phishing email into a tool IT can use to instantly train employees. When a user clicks on any of the 2,100+ KnowBe4 simulated phishing emails, they are routed to a landing page that includes a dynamic copy of that phishing email showing all the red flags. You can also customize any simulated phishing email and create your own red flags. Users can then immediately see the potential pitfalls and learn to spot the indicators they missed in the future. Vishing Security Tests using IVR attacks over phone (Gold level on up). Supports US and International, both pre-recorded messages and text-to-speech campaigns using system templates or admin-customized templates. Automate the path your employees take to smarter security decisions. With the powerful new Smart Groups feature, you can use each employees’ behavior and user attributes to tailor phishing campaigns, training assignments, remedial learning and reporting. You can now create “set-it-and-forget-it” phishing and training campaigns so you can instantly respond to any phishing clicks with remedial training or have new employees automatically notified of onboarding training, and much more. The "Incremental Phishing with Smart Groups" video has been published in the Help Center. Here is the link. As the Security Awareness Training project leader, KnowBe4’s Active Directory Integration allows you to easily upload user data and saves you time by eliminating the need to manually manage user changes. Once the ADI is configured, users will be added, changed and archived in sync with changes made within AD automatically. For security reasons, the synch only works one-way. You can also upload users with CSV files. You also get enterprise-strength reporting with the new Virtual Risk Officer and Advanced Reporting features that gives you actionable metrics on your security awareness program. Executives get the insight they need to maximize training ROI and track security compliance. The Admin Console provides instant graphs of training effectiveness. You can also leverage KnowBe4's Reporting APIs for custom reports and dashboards that integrate with other business systems to showcase your security awareness program statistics. If you manage multiple KnowBe4 accounts, Roll-up Reporting makes it easy to select reports and compare results in aggregate across accounts or multi-location offices.